From a powerful review paper in Science on the Trophic Downgrading of Planet Earth (DOI: 10.1126/science.1205106) James A. Estes and many other ecological stars documents the strong role of apex consumers (i.e. big herbivores like elephants) and top predators (e.g. wolves). Fig. 4. 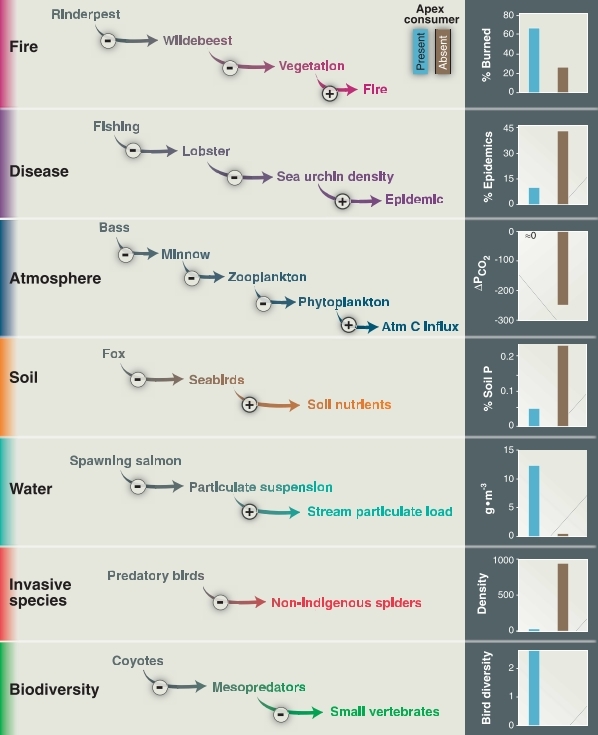 Examples of the indirect effects of apex consumers and top-down forcing on diverse ecosystem processes, including wildfires (30); disease (35); composition of atmosphere (37), soil (47), and fresh water (49); invadability by exotic species (55); and species diversity (60). Interaction web linkages by which these processes are connected to apex consumers are shown in the center. Magnitude of effect is shown in graphs on right. Blue bars are data from systems containing the apex consumer;brown bars are data from systems lacking the apex consumer. Data replotted from original sources (cited above), except raw data on native bird diversity in chaparral habitats provided by K. Crooks.